Waterproof, Dust-proof, Shockproof and Crush-proof! This camera ticks off all the boxes! Yesterday, SONY Malaysia revealed their newest addition to the family of game-changing cameras, they’re known to produce(A7RIII, A7III, etc). Satoru Arai (Managing Director of SONY Malaysia) and Look Kah Kit (Head of Digital Imaging, Product Marketing of SONY Malaysia), took to the stage to announce the world’s smallest AND lightest premium ultra-compact camera, the RX0 II! They demonstrated its ability to withstand water and damages through a video that not only emphasised on its amazing versatilities and functions, the physical appearances of being tiny not only makes it pocket-friendly, but extremely adorable too! If those qualities aren’t enticing with how easy it is to make the perfect vlog/take the perfect selfie, we don’t know what will! And when we say lightest and smallest, we mean 58mm x 40.5mm x 35mm and that totals to a 132g! Say goodbye to sore arms and hello to getting YOUR perfect shot! They’ve also invited renowned YouTuber, Phei Yong to the stage, as he speaks about the camera and how since he’s used the RX0 II, it’s made his experience in filming that much easier. After that, they move on to exhibit some of his comedic-informing and scenic videos using the RX0 II. Still don’t believe us? 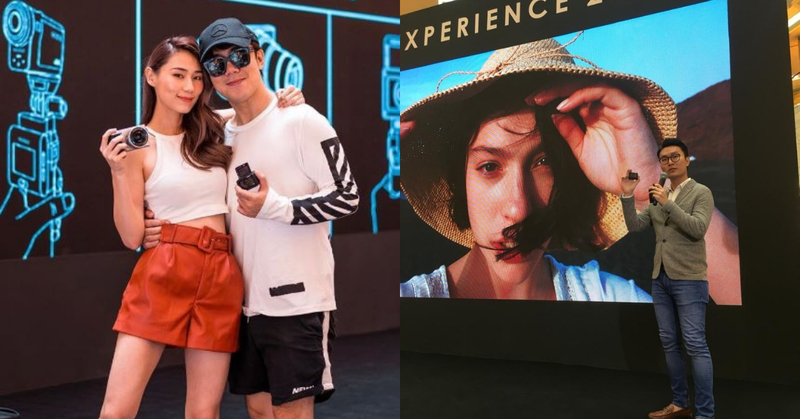 Check out influencers, Yang Bao Bei, Alicia Tan, Joseph Germani, Jane Chuck and Ashley Lam, who showed up to the launch and cannot wait to get their hands on it! From the smallest and lightest, to the fastest. SONY introduces its a6400 Mirrorless Camera. The a6400 has the world’s fastest auto-focus detector and can acquire the perfect boke’s to action shots in a matter of 0.02 seconds! Not only does it have 4K video recording, it also has a 180-degree LCD flip-screen and get this, IT’S GOT TOUCH-SCREEN FUNCTIONALITY! The 3.0-type LCD screen not only works as your typical Touch Pad, its got Touch-Focus, Touch-Shutter and Touch-Tracking (“Real-time tracking”) all at your fingertips, ensuring that you get the shot that you deserve. The LCD touch-screen/flip-screen has 921k-dots of resolution that effectively helps with framing for capturing selfie-style shots as well as still and video capture. This allows the person behind the camera to check the screen for better composition and preventing doing multiple re-takes, while maintaining the best quality! The event definitely inspired the inner-creator in us, and it had everyone at the event in a frenzy of excitement to get both cameras on their hands. The a6400 is already available in stores for RM 4,399. As for the RX0 II, it will be available in Malaysia on this MAY 2019 for only RM 2,799! We don’t know about you but we are so getting it! Check out Sony Malaysia’s Instagram to learn more!